One area you might not think about right after your elderly family member is diagnosed with dementia might be the kitchen. At first blush, this isn’t a dangerous room, but there really are some situations that can become dangerous quickly in the kitchen. Experiment to find solutions that work best for her while also allowing her to have some independence. Your senior’s memory may not work the way that she expects it to, which might mean that you need to rethink where some items get stowed in the kitchen. If there are items that she uses every day, you might want to keep those more visible. Labeling cabinets and drawers can also help. Eventually your elderly family member might find that she forgets that some items in the kitchen are dangerous. You might want to set up a cabinet or drawer that you can lock or otherwise secure where you store anything that needs to be in the kitchen but that could be dangerous. Child safety locks can be secure enough to do the trick. Your elderly family member might start to have trouble with mobility and manual dexterity, both as a part of dementia and as part of unrelated issues. One solution that can help quite a bit is to replace regular dishes with divided plates that allow her to scoop her food onto her fork more easily. Also, brightly-colored plates and bowls can contrast better with foods and make them easier for your senior to see. Cooking may eventually become a problem for your elderly family member, even if she’s loved it in the past. Hiring elder care providers now can help them to get to know what she likes to eat and how she enjoys eating certain foods. Then as it becomes more difficult for her to manage her meals on her own, she’s already got help right there with her. Talk to your senior in the early stages of her diagnosis about what she’s comfortable with in her kitchen. 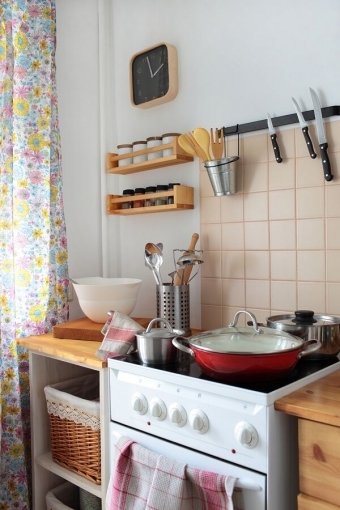 If she’s feeling unsafe with certain utensils, you can swap them out for a different type or style. At some point, she may decide that she doesn’t want to risk injury by doing too much in the way of cooking. Wherever their home may be, our caregivers can help keep your loved ones safe. Call our local Niagara office at (289) 434-4704 to learn how homecare services can assist your family.